Google released an update to its Transparency Report that reveals government removal requests are at an all-time high, and increasing at a rapid pace. Full details at Bit Tech. 'Unfortunately, what we’ve seen over the past couple years has been troubling, and today is no different,' Dorothy Chou, senior policy analyst at Google, writes of the latest report. 'When we started releasing this data in 2010, we also added annotations with some of the more interesting stories behind the numbers. We noticed that government agencies from different countries would sometimes ask us to remove political content that our users had posted on our services. We hoped this was an aberration. But now we know it's not. 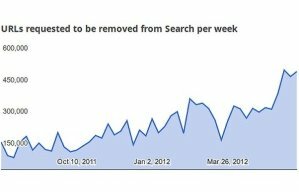 Google's annotations for the US make sombre reading: between July and December 2011, US agencies made 103 per cent more content removal requests than in the previous period. These requests included a demand to remove blog content which 'allegedly defamed a law enforcement official in a personal capacity,' and another from a local law enforcement agency to remove 1,400 YouTube videos for alleged harassment. Neither requests were satisfied.